Could an author be both mainstream and thoughtful, both entertaining and aspirational? Wolfe told us yes, showed us how, and begged us to beat him at the game. Eleven years after Bonfire he proved he could tackle the social novel in different geography with A Man in Full, bringing realism and nuance to an equally vibrant cast of characters in the financial machinations of Atlanta. Again he beckoned all comers to rise to a more demanding creative standard. We couldn’t beat him, but we sure could take out pen and pad and play along as if the contest were open for anyone brave enough to enter. Current events become history. Tell even the simplest stories with flair. What you chronicle for the present becomes a time capsule that can be unwrapped in ten years or a hundred. Reporting on contemporary events is a noble calling, but framing them within multiple prisms of context transforms ordinary happenings into perpetual discussions of culture and significance. Every year the Los Angeles Times Festival of Books continues to cement itself in my psyche as a major go-to event. Now the largest book fair in the United States, its bustling aisles fill the USC campus for two days with eager authors and insatiable readers. Each year I joyously look forward to attending, not just for the schedule of talks I plan to experience, but for the inevitable surprises I discover. This year’s surprise was an exceptionally powerful book talk on an open-air stage by Tavis Smiley about his lifetime of interaction with Maya Angelou. Although I have not yet read Smiley’s new book, My Journey with Maya, my takeaway from the forty-five minutes my wife and I listened to him speak was profound enough to report here as a stand-alone inspiration. Smiley talked openly and honestly about how he personally crashed and burned after a failed election campaign for Los Angeles City Council following a gig on the staff of Mayor Tom Bradley. With a mountain of campaign debt crushing him, he was to be evicted from his apartment with no prospect of employment. A friend arranged a happenstance job for him to travel with Angelou on a brief trip to Africa as an assistant, mostly to carry luggage. That kicked off a lifelong friendship and dialogue between them where they didn’t always agree, but Smiley always found a way to learn. If you think those are just broad, sweeping, generic statements of advice from the elevated dais, stop here and go read someone else’s reflection, or perhaps today’s stock market results. On the other hand, if you’re like me, copy those words onto a Post-it and put them in plain sight for the next decade or so. When Maya speaks, it’s a good idea to listen. Tavis did, and his life was reinvented. I write a lot on this blog and in my books about resilience and reinvention, the lifeblood of innovation. When I heard Smiley put the notion of self-motivation in so few words from Angelou, I was heartened, invigorated, and inspired. She got it. He got it. I wish everyone could get it. And still, transferring the words of others into action is immensely difficult, filled with pain, buried in setbacks, and only on the most wondrous of occasions celebrated in brief victories. Smiley was adrift after losing his election and identity in public service. He sat stunned and stared at the failed image of himself. He wanted desperately to reinvent, but had no idea how. He was frozen. Angelou saw through him to his core. “Baby, we find our path by walking it.” If it had been a Nike commercial saying “Just do it,” it couldn’t have been clearer advice: Just do something. Do anything that matters to you. Find thought in action, not in dire contemplation. Whatever you do is better than nothing, and it will inevitably lead somewhere. Sometimes I tell people to form a plan—a conceptual roadmap of any kind—not because you will follow the path from here to there, but because if you start with a map, you will go somewhere, and that has to be better than nowhere. You won’t connect the dots—the dots will connect themselves in ways you never could have imagined. Yes, you find your path by walking it. Get busy. The rest will be discovered when you least expect it. Smiley was crushed because the electorate said no to him. He wanted to serve, but the voters said “no thanks.” Again Angelou saw motivation in the otherwise unfortunate result. “Sometimes rejection is redirection.” If the voting public did not wish to recognize Smiley as an elected official, was that the only way he could realize his dreams? Obviously not, because a few years later Angelou appeared as a guest on Smiley’s national PBS talk show. How about that? From apartment eviction to the interviewer’s chair in so little time you almost think he made the whole thing up. He didn’t. He listened. He accepted “no” as meaning “not now, not here.” Then he went another way, and his dreams were realized beyond all imagination. Can it happen to you? Yes, if you see the negative before you as motivation to go another way. That new way might be a million times more fulfilling than what you thought was your only way. We have no only way, just opportunity to be who we need to be in an as-yet undiscovered path. I sure do love the Los Angeles Times Festival of Books. I can’t wait until my walking path takes me back there next year for another dose of redirection. See you under the tents. I’ll be the guy taking copious notes, or maybe talking ideas if you start the conversation. One of the themes I explore in my forthcoming debut novel, This is Rage, is the notion of motivation. This is a subject I hold dear, and one I focus on a great deal in the executive coaching workshop I co-lead with John Vercelli. If all a mission statement is meant to do is fill a half page in your human resources handbook, it is probably not worth the time to write it down. One of my former teachers and board members used to say he had a vision of all the great mission statements in the world collected in a single volume, and there could be no possible better bedtime sleeping remedy than trying to force oneself through those pages with one’s eyelids open. Again I agree, if a mission is just a string of words — Buzzword Bingo without a juicy prize — it will not motivate, but let’s consider a few potential examples of applying a personal leadership mission in attempting to inspire a team. To make this department much more efficient and profitable! To overcome market forces and prevail over our competition! To provide my team with the support and resources they need, to the very best of my ability, to collaborate and do the very best work of their careers. Not gonna inspire, management by fear is so not cool. You’re starting to get my attention, through an occasional yawn. I’d build you a log cabin in the arctic if you asked me. Call me an optimist; people like to be inspired. It’s not a sleight of hand. Real leadership means rallying people around a cause, to subordinate their own personal quirks to the shared agenda adopted. The leader’s job is to create the environment for sharing. Is it the business leader’s job to make her or his department more efficient and profitable? Do we really need to ask? It goes without saying, so don’t seek glory in the obvious. Is it the business leader’s job to respond to market forces and win market share from the competition? Once more I ask, where’s the question? Any answer to this presupposes a complete lack of faith in the common sense of why we are employed by our company and not another. Is it the business leader’s job to rally, help, support, test, and muster the collective wisdom of those assembled to form a team and work together? That should be just as obvious, but try saying it aloud and look at the surprised gazing around you. That’s what people want to hear. Uttering the manifesto is the first step toward building trust and accomplishing the impossible. True, it’s just the first step, and trust is easily shattered when actions upend words. Yet it’s an important step, and it does fire up hearts and minds much in advance of a spreadsheet. It also connotes vulnerability — to the very best of my ability — which again is all in fact you can ever do. Not proclaiming more makes you human, perhaps a form of life other people are more willing to follow. Be honest, not only about what you can do, but in admitting that you are not de facto possessive of superpowers. Try it out, it just might give you superpowers. In my novel, a few clever and powerful people are trying to make a whole lot of money. That is not a bad thing, until they forget that how you make the money is the difference between taking along a deserving set of others and leaving almost all of them behind. Most of the people in the story just want to do their jobs, to find a way to love their jobs, to shake off the demoralization that has come from the illogical separation between task and income. When a job is a paycheck, you don’t need a mission statement or real leadership, you just keep your head low and get through the day. When a job is about something more, it’s still a paycheck — we all need a paycheck — but the purpose of the work is a much more substantial driver, creating better outcomes and better paydays. Improved business comes from more engaged employees, and getting those employees engaged is a soft skill that in the hands of a master can conquer most obstacles. That’s when work is fun, when we believe in something, when we believe in the leaders and their values and their rallying cries and we choose to be a part of innovation’s path. The promise of the start-up is to build something new with heartfelt values at its core, and in closely held companies at modest scale it is much easier for founders to maintain the kind of personal mission and creative culture that reflects this entrepreneurial DNA. When an exceptional start-up enters a period of hyper growth, hands on sustenance of idealized culture becomes considerably more difficult. Should the start-up go public, it too easily can take on the shape and form of the goliaths it sought not to be, and then the challenge of maintaining a mission grounded in shared values is often put on trial. The disconnect between what was innocently envisioned and what inertia morphs can be terribly upsetting to the grasping loyals, who hold their idealism in longing, hoping at length for the pledge to retake honest meaning. Still it is important to remember than the personal leadership mission can endure. Indeed it might be less than a grand corporate mission statement, but I believe conviction is almost always within a business leader’s reach at all levels of an organization. Committing to a personal leadership mission is a choice — a brave choice with its own risk — and while rare, a good one in the spirit of Choice 3 has a decent shot at creating significantly more employee engagement and long-term value than the other two slug lines. It’s all a matter of executive style, setting a tone for the broadest possible positive, tangible outcomes. It is too easy to check out, and once people check out, try getting them to check back in. As my story compounds, an awful lot of people check out — because they don’t feel valued, because they don’t feel inspired, because they see what they do each day as separate and divorced from the actual process that creates income for the business and value for the shareholders. Tie those pieces back together and real innovation comes a good deal more naturally. Leadership is not so much a word as a behavior, a walking example of what it means to be intertwined with the enterprise. It does begin with words, words that are grounded, words that do something. Choose those words carefully, lead by example, motivate by inclusion, dole out support without reservation. You want to keep things humming, make it a little less comfortable and a little more complicated — for yourself, not those you guide. In the book, I take you to the extremes of this world view, heroic and cowardly and all that binds the spectrum. The words did not come easily to me, but I committed myself to resilience and found them over time. You can, too. I have mentioned now and again that I have been working on a novel for a few years. It’s time to share a few more details. First of all the title: This Is Rage. You will discover why I called it that if you read the sample excerpt on my teaser site and other fine channels we will be utilizing in the coming months, like Amazon or Barnes and Noble, where you can currently place your pre-order that will be shipped when the book is officially released on October 8, 2013. Shameless, I know, but I am officially in the pull marketing business effective immediately. There are two protagonists in the story, who are also both antagonists, at least to each other. They are each hero and villain in the broader context of economic turmoil, which they aspire to improve, but not surprisingly mess up on high-octane, mostly by accident. Kimo Balthazer is a disgraced radio talk show host, who seeks redemption in the obtuse netherworld of internet webcasting. Daniel Steyer is a venture capitalist at the top of his game, looking to go out huge with the deal of a lifetime, but market forces have other plans. That’s not the order in which you will meet them, and you’ll find out why. At the outset they don’t know each other exists. They don’t even know each other’s world exists. But they soon do. And they don’t like each other. At all. I am going to do the right thing and not toss out any spoilers, but I can say that you will spend some time in Silicon Valley, some time in Los Angeles, and some time in Washington D.C. You will be introduced to the world of Investors, Bankers, and Operators, the three points of an ever-forming triangle that comes with its own hierarchy, rule set, chaos, and politics. You will also meet a curious politician with a tangential agenda, a conflicted movie studio boss, the co-founders of one of the most successful tech-start-ups ever, and a pair of would-be entrepreneurs turned criminals whose interpretation of thinking different is not quite what their families had in mind. You will be invited into board meetings and venture partner meetings. You will hear the voice of Kimo in your head. You will see what happens when ego and presumption run amok, and the notion of control spirals into hyper normalcy, where random boo-boos add up big time, and the consequences are strangely real and familiar. My key influence for this book is Tom Wolfe, whose first novel Bonfire of the Vanities blew my mind in ways that still shake me to the core. I didn’t know what a bond trader was the first two years I was in college. Then I saw a bunch of guys my age lining up in blue suits to be interviewed to become one. They went to Wall Street and became extraordinarily wealthy selling paper promises to their clients. Then came the broad implosion of junk debt. Michael Lewis, whom I also tremendously admire, made his debut as an author writing about this phenomenon. I saw the impact on my friends, I saw the impact on New York, and I felt the impact on our economy. What I admire to this day about Wolfe’s work was how he wove storytelling through the observational narrative, migrating the educational lesson to character development, and burying the polemic in a moral tale for the ages. I was studying theater at the time, without notion of how I might fit into the business world, or even if I could make a living given what I valued. A quarter century later we seem to have forgotten the fall of the junk bond kings. The miracle of Silicon Valley has replaced the lustre of Wall Street and the allure of Hollywood. I have played my whole career in this fantastic environment of innovation, the arranged marriage of technology and media brokered by the matchmaker financiers, and the output had been invigorating. We have created jobs, opportunities, and a good deal of wealth — but not for everyone. In the same way that Wolfe and his New Journalism looked beyond the restaurants and clubs and luxury high-rise suites, I have seen the scary trailing the good. Where there is big money there are big personalities, and where there is a win-lose battle fought daily, often those who lose are the secondary foils who play by the rules without insight into the eccentric ecosystem. That is the story I wanted to tell. That’s why I wrote a business novel instead of a non-fiction set of adages. This was something I needed to do, part of the continuum of my journey. I started my career in storytelling, then helped bring storytelling into computer games, then found my way into profit and loss, and now I come full circle. I needed a way to bring these elements together, to find a synthesis of my passions, which include the theatrical, the financial, the philosophical, the hope of justice, and a touch of dark humor (hopefully more than a touch!). In the coming months I will tell you more about the publishing journey, but I cannot conclude this project announcement without a sincere thank you to my brilliant editor, Lou Aronica, under whose independent imprint The Story Plant my book is being published. Lou is a Mensch in every sense of the word (Google it if that’s unfamiliar to you). He has been a steadfast believer in This is Rage since we met each other last year on Twitter. It’s not just the notes that he gives me, it’s the way he communicates his viewpoint that makes me want to rewrite a fourth time when he is only asking for the third. I think Lou, a bestselling author himself, is at the forefront of New Publishing in the same way Wolfe wanted New Journalism to embrace the opportunities of Creative Destruction as a positive force for change. Wherever this journey takes us, I am delighted to be paddling alongside a friend on this whitewater river of 21st century digital publishing — with a paperback to boot. So that’s the introductory story of my novel. It’s my first, I hope not my last, and I welcome you to come along and share the journey with us. It’s for you, and it’s about you. I hope to entertain, and maybe share an idea or two as the whitewater rises. I have been agonizing for weeks whether to write about Rielle Hunter. The notion of a single additional millisecond consumed by the public on this media danse macabre peels the skin from my typing fingers. Still I need to share a few words, less about what’s happened, more about how troubled I am with our inability to look away from the body. Rielle Hunter is not a celebrity, except that she is. She had a sexual relationship with a married man. She got pregnant. She chose to have a baby. In all sanity, it ends there. Give the child the slimmest chance at a sane life. Be with the child’s father, don’t be with the child’s father, just go away quietly and be a good mom. How hard is that? Apparently it’s hard because there’s money at stake. As fate would have it, the father of her child was once a party primary candidate for President of the United States, and then the ticket’s Vice Presidential candidate in a national election. How about that. His wife happened to have cancer at the time of both the election and the affair. Now she has passed away. He happened to try to hide the affair from his wife and may have crossed a few lines in doing so, enough to get him hauled into court and tried, although not convicted. Okay, it has to end there. Give the child a shot at any kind of normal life. Preserve any fragment of dignity left for mom and dad. Separate your private life from public spectacle, at least so the public does not have to disgrace itself. Nope, there’s real money at stake. She cannot help herself, she is cashing in. We are letting her cash in. She didn’t take her fifteen minutes of fame, we are giving it to her. We cannot seem to help ourselves any more than she can. I am not reading the book. I am not watching the television interviews. Ms. Hunter has nothing important to say, not a word of value will cross her lips. Yet I can’t miss her, she’s everywhere. Why does anyone care? Why do we feed Piers Morgan’s hunger for this flavor of anesthesia by subscribing to it? It’s supply and demand, free-market capitalism, 100% free speech, no law against it. Nope, don’t want to regulate it. Nope, don’t want to restrict it. Completely agree. Criticize me if you wish for condemning a book I have not read, but if this is a book, we have forgotten what it means to read. There are an infinite number of interesting topics to ponder and curious events to discuss — the mending of our nation’s polarization, Europe’s seesaw economic outlook, interest rate fixing scandals, Wall Street arbitrage incinerating millions of dollars on derivative trades, heartening private sector innovation at wondrous new companies like SpaceX, lower gas prices for summer, a new Aaron Sorkin show on HBO, and a new novel by Kurt Andersen. In 1992 Roger Waters produced his last solo album called Amused to Death, inspired by Neil Postman’s 1985 landmark book about the grinding impact of media on our critical thinking abilities. It was dark, even for Roger, and it didn’t do too well. It was about a monkey watching TV, just changing the channels on the TV, over and over, through an invasion of our planet by other-worldly creatures observing our demise, until the apocalyptic concluding refrain, “This species has amused itself to death.” Both Postman’s book and Waters’ album preceded the commercial internet, and their observations were anything but unique. 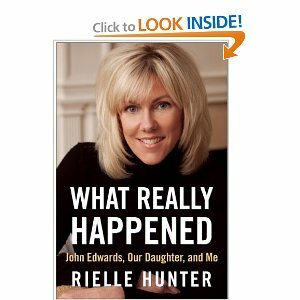 But when I saw Rielle Hunter on her book cover staring at me from a display shelf, suggesting there could be any reason for me to buy and read her transcribed words, all I could hear was that refrain: This Species Has Amused Itself to Death. Well, we’re still here, so not yet, right? We can pay attention to more important things if we want, no shortage of free will to be entertained. We all have our own ideas about what’s relevant. News. Politics. Music. Family. Sports. Pets. Who’s to judge? Does it matter that Entertainment Tonight fills a full hour following every 23 with fluff we used to dismiss as tabloid? Is there any way that hour could be better used, perhaps to learn the name of a local candidate running for State Assembly or why Shakespeare wrote The Merchant of Venice? Maybe not, but it’s bugging me, mostly because I once campaigned for John Edwards and believed he could have been a decent Vice President and/or President of the United States. Now I feel ashamed — ashamed that I was ever on this bandwagon, ashamed that I was duped by lies, ashamed that he denied a child he fathered and can’t take that back, ashamed that we are still paying attention to the mother of that child. I don’t like the way this feels, and I want it somehow, at some level, to stop. That’s my problem. This one notches beyond tabloid, because the clever maestro Ms. Hunter has made an active choice to compose opportunistically despite the requisite price. She is fully aware of the stakes, the trade, the auction, and the orchestrated bait. Still this compromise of judgment is not Rielle Hunter’s problem. It’s not John Edwards’ problem. This is our problem. I am picking on them to make a point, an egregious case that is emblematic of serial apathy. If we can’t help ourselves and just keep gobbling up this gunk, then in an amiable daze we hand wealth to those who least deserve it, financial reward for nothing earned, nourishing amusement an abandoned aspiration. Our thoughts turn to mush, and there we sit on the cold floor tile, trapped again in a Waters’ refrain, banging our hearts against The Wall until we are Comfortably Numb. This species can do so much better than that. Really, we can.